Ahh, LL Live! When I learned from my girl Dana in Baltimore that LL would perform live in LA, I immediately reached out to my equally music obsessed friend Billy Johnson at Yahoo for his assistance in getting me into the show. Mission Accomplished! Thanks Billy! I've seen LL perform live many times but never in an environment as intimate and friendly as Nissan Live Sets, where the arist also participates in a Q&A session with the fans. 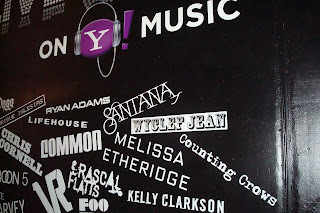 The show, filmed in a state of the art soundstage will air on August 15th on Yahoo! Make sure you log on to check him rock out. Past performers include: Christina Aguilera, Common, Sheryl Crow, Ne-Yo, Maroon 5 and many legends and chart toppers. LL performed as many classics as he could fit into the live taping, such songs included: "Mama Said Knock You Out, Doin' It, Hey Lover, Loungin', Headsprung, and Around the Way Girl". He also performed singles, "Baby" and Heartbeat" from his soon to be release, Exit 13. One of the songs I was beyond impressed with during his performance was "Laptop Gangstas", which is featured on his Kay Slay Presents: The Return of the G.O.A.T mixtape cd. He performed an accapella version of the song, with the delivery of a poet ala Dej Poetry Jam. He talks about haters wanting him to give up on is career because he's been around for a long time, but he's sayin', "I still got it, why should I stop"? I concur. He describes himself as Classic instead of Old School or New School and understands his relevance and where he fits in the entertainment industry. During the Q&A portion of the show, one giddy female fan asked if he could lick his lips for her, of course being the Lady Lover he is, he obliged. Geez, where is his Chap Stick commercial? Doesn't he have a deal with Chap Stick? Talk about a commercial I would love to be in. Thank you's: Billy Johnson, Janda Lane, Stephanie Arnoldy, and Dana Smith. This blog post was made possible because of you all. Thanks!